It might have been Game 5, but the showdown between Kansas City and New York in the Big Apple had the feel of something much bigger. Down three games to one, the New York Mets were fighting to keep alive their hope for a first World Series title in 29 years. For the Royals, the stakes were equally high as they were trying to clinch the club’s first championship in 30 years. Throughout the first eight innings, it was the Mets that seemed poised to extend its life another game. Curtis Granderson hit a solo home run in the first inning and Lucas Duda drove in Granderson on a sacrifice fly in the sixth inning while starting pitcher Matt Harvey cooled off Kansas City’s hot bats. But with two late comeback victories already during the World Series, the Royals proceeded to make history with a two-run ninth inning followed by a five-run 12th inning that led to a 7-2 win and the championship. The result was particularly satisfying for Dayton Moore. Back in 2006, he was the assistant GM for the Atlanta Braves and loved the job he had held for 12 years. 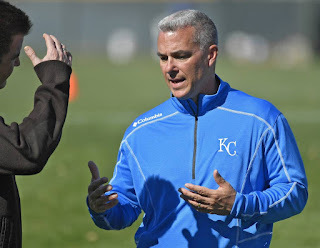 When the Royals called to offer him the General Manager position in Kansas City, he nearly turned down the opportunity. Moore had previously turned down two other teams, but this time thought long and hard about the chance to move closer to his hometown in western Kansas. Ultimately, it was a phone call to his spiritual mentor that helped him accept the job. Tim Cash, the Braves team chaplain, had some simple, but powerful words for Moore. There was a lot to fear taking the job in Kansas City. It was a small market that had not experienced much success since winning the World Series way back in 1985. When Moore took over, the Royals had finished above .500 just seven times during that time frame, and it didn’t get much easier. The club suffered through another seven losing seasons before breaking through in a big way during the 2014 season but fell short in a heartbreaking seven-game World Series against the San Francisco Giants. But Kansas City bounced back and found its way to the Fall Classic despite some close calls and near misses that could have derailed Moore’s long-term plan. Regardless of the outcome, Moore has remained steadfast in his desire to impact players’ and coaches’ lives. And because of his belief in the message found in 2 Timothy 1:7, Moore was able to transfer his passion into an inspirational if not unlikely success story. Dear Lord, we thank You that You didn’t give us a spirit of fear. Thank You that we can face any situation knowing You are giving us strength. In the Name of Jesus, Amen.